"Alaska Natives" arrived in Alaska from across the Bering Land Bridge about 20,000 years ago. Alaska marriage and divorce records become public records 50 years after the event. Records are available to family members and their legal representatives with proper photo identification. Note that Alaska marriage records are available for most of the 1890s but that many events before 1930 were never registered with the Bureau. Alaska divorce records are available from the Bureau of Vital Statistics for divorces granted from 1950 on. Earlier divorce records are at the clerk of the superior court in the judicial district where the divorce was granted (Juneau and Ketchikan [First District], Nome [Second District], Anchorage [Third District], and Fairbanks [Fourth District]). 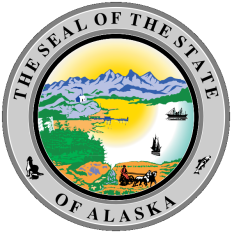 See http://www.hss.state.ak.us/dph/bvs/ for information on how to obtain certified copies of Alaska vital records. Payment for vital records may be made by personal check or money order only. Note: The Bureau of Vital Statistics maintains offices in Anchorage, Fairbanks, and Juneau. The web page gives the address, phone number and directions for each location. Record Access Requirements: Person requesting must be one of the registrants or an attorney representing a registrant. Records are public after 50 years. Search Note: Include wife's maiden name and a daytime phone number. Direct questions to BVSOFFICE@health.state.ak.us. Person requesting must be one of the registrants or an attorney representing a registrant. Records are public after 50 years.Search Note: Also, include a daytime phone number. Direct questions to BVSOFFICE@health.state.ak.us. Note: The record center located at 825 W 4th Ave.
Record Access Requirements: Records are not destroyed. Note: The state releases three types of records - Full Criminal History, Interested Person, and Any Person. Searches may be name-based or fingerprint-based. A Full History is only available to the subject or to government agencies. Record Access Requirements: "Interested Party" results are for those granting supervisory power over children or dependent adults and contain all records. "Any Person" contain past convictions and current offender information. Name searches return state records only. Search Note: Fingerprints return state records and for "Interested person" requesters who so desire national results from FBI files. Record Access Requirements: Location, physical identifiers, charges, bail data, conviction and sentencing data are released.